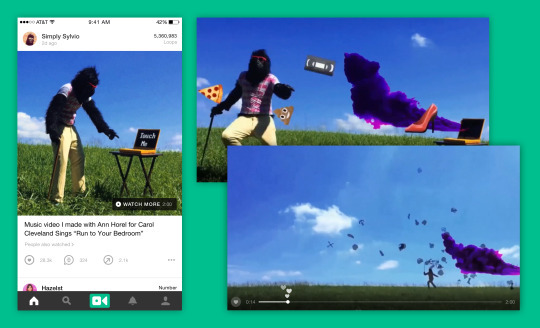 As part of Twitter's wider efforts to streamline and re-focus the company, announced as part of their Q3 earnings results, the 6-second video app Vine will be shuttered. Released in 2013, Vine quickly established itself as a valuable content channel, and in particular, a key source for trending content and memes. Last October, the app reported that it was seeing 200 million users per month - up from 100 million only six months earlier - while it had consistently held its place in the iTunes Top 100 apps in several countries. 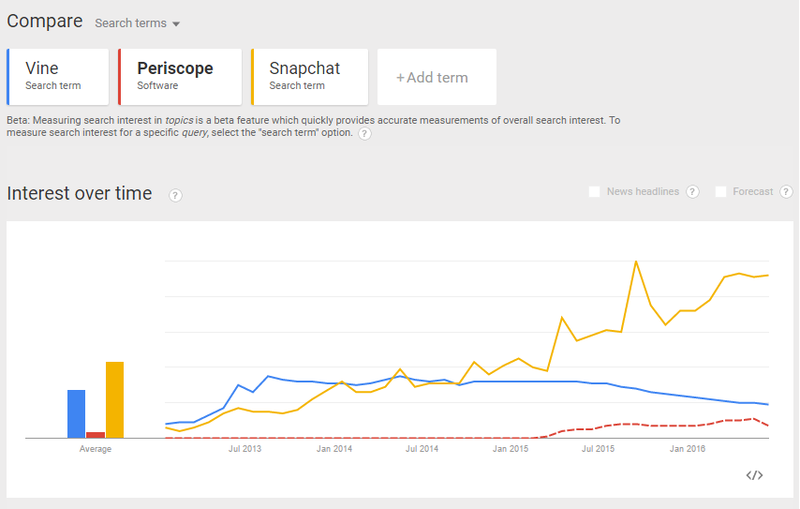 But in more recent times, Vine has struggled. While no official numbers have been released, a former Twitter executive told BuzzFeed that usage rates have been low - likely due to the growth of Snapchat and other, more popular video options - while the company has also lost almost all of its top product and business leaders, with nine of their most senior employees leaving in the past six months. Even without definitive user numbers, there are indicative measures that Vine had lost its appeal. Looking at Google Trends data, you can see that search volume for Vine has been on a steady decline, while, comparatively, Snapchat has rocketed on by (I've added Periscope too for additional comparative measure). Contributing to these declines, much of Vine's creative community have also moved on to bigger platforms where they can reach a wider audience and enjoy more significant monetization potential. Fixing that problem has been a focal point for Twitter, which has introduced a range of measures to try and keep Vine creators on side, even flying some of them around the world as part of their Twitter Amplify program. Twitter also added pre-roll ads to Vine content, with 70% of the revenue going back to creators, but the potential of any significant monetization on 6-second content is, of course, limited. This may be why Twitter also added a 'Watch More' option back in June which enabled creators to record Vines up to 140 seconds in length - or even up to 10 minutes for selected partners. In retrospect, that change may have been the white flag for the app - the fact that Twitter couldn't work out a viable monetization process, and had to fundamentally alter the core function of the platform to find one, suggests that they were struggling to understand how to deal with it. According to the official announcement, nothing's happening to the app straight away. "You'll be able to access and download your Vines. We'll be keeping the website online because we think it's important to still be able to watch all the incredible Vines that have been made. You will be notified before we make any changes to the app or website." Interestingly, it appears there's at least some conflict at Twitter HQ about how the platform has been handled, with Vine co-founder Rus Yusupov tweeting this advice following the announcement. That's not a particularly great endorsement for the management team at Twitter, but then again, Twitter's plans to streamline their team (reducing overall staff by 9%) and refine their product focus have been mostly received positively by the market. 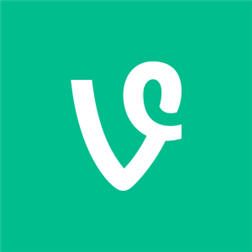 It's not clear if Vine's entire staff of 50 people will be part of those staff cuts. But even with that bigger picture perspective, it's still a sad end for the app which provided exposure to a range of creative talent, including Lele Pons, KingBach, and Logan Paul, all of whom have been able to leverage their Vine content into lucrative careers. Personally, I felt Vine had a lot of potential, particularly when you consider Facebook's three stage playbook for monetization, the model they use to build their apps and offerings. As reflected in the numbers, Vine had the first stage down, and plenty of brands used the platform, giving them ample opportunity to add brand-specific tools and options. It seems a shame they couldn't get the rest together in order to build and maintain that audience. In reflection of the announcement, I felt this Vine, one of the most looped ever, is probably a fair reflection of the fate of the app. Whether that big ball represents Twitter or increased competition, I'll let you be the judge. Hopefully the embed doesn't die out.